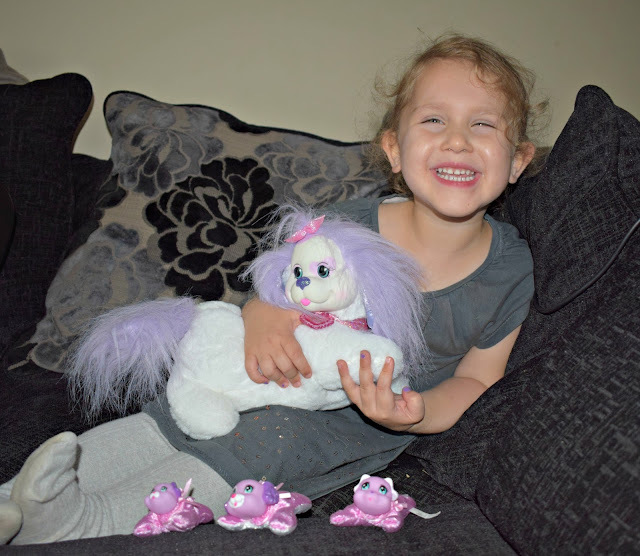 Like most kids her age Evelyn loves animals, the smaller and cuter the better but in reality she loves all animals. 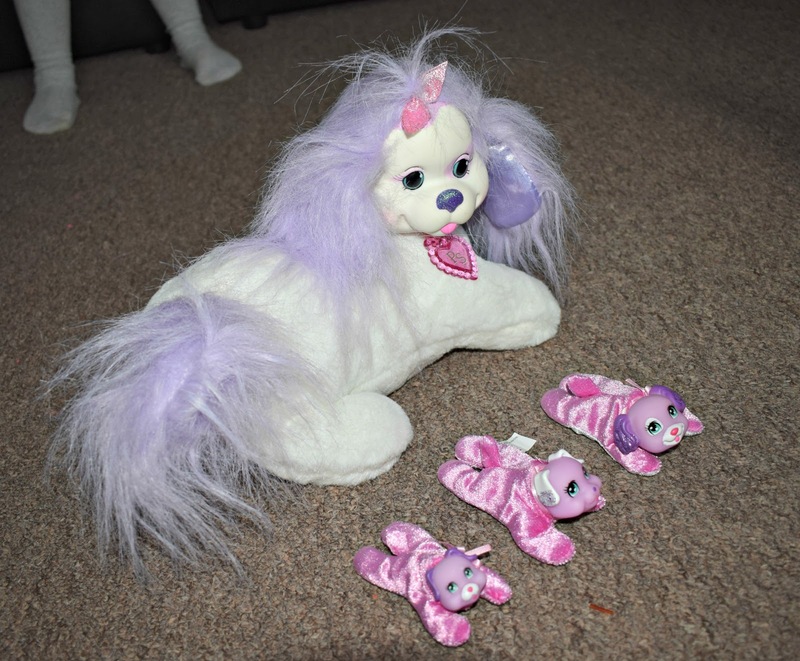 So when I recently received an email offering us the chance to review a Puppy Surprise toy I jumped at the chance. 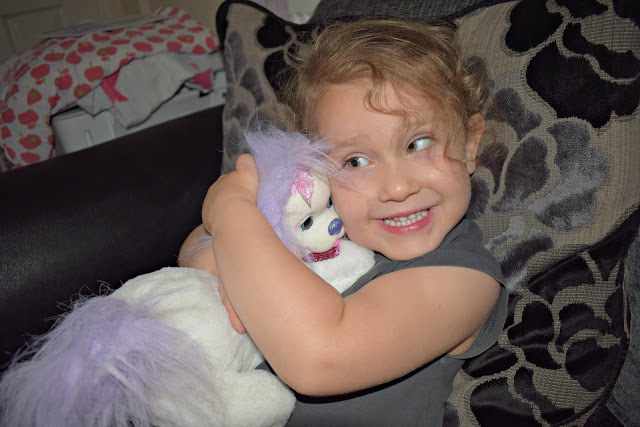 I knew the puppy surprise would be something Evelyn would love caring for and might just be the solution to her constant asking for her own puppy (we can't have pets where we currently live). I wasn't wrong! When the Puppy Surprise arrived the smile on her face was huge, she just wanted to get the puppy out of the box and hug it. She couldn't believe her luck when I told her there were actually baby puppies inside the mummy dogs tummy. Puppy Surprise is a soft toy that includes a soft and huggable mummy dog with a surprise number of puppies in her tummy. Each puppy surprise dog has a surprise number of puppies inside ranging between 3 and 5 pups. The puppies could be boys or girls and there is sometimes even a runt of the litter (a smaller pup)! The most fun element to these is of course the surprise element to them. The kids loved the fact they didn't know how many puppies the mummy had and they loved discovering them inside her tummy. I was a bit miffed that one of the puppies was already visible in the box and outside of the mum which I think took away part of the surprise, we already knew what the pups looked like etc. I think this bothered me more than the kids though! One of our pups barked which was quite cute and Evelyn is particular loved this. Both the mummy dog and the puppies are soft bodied but have hard heads/faces which I think makes them a bit more durable and hard wearing, which is always good when kids are involved! The hair on the mummy dog is brushable something which Evelyn has loved doing, it would have been nice to have a little brush or comb inside the box for this but it didn't take away from the toy at all. Evelyn loved caring for her mummy dog and it gave us a great talking point to talk about how we would care for a dog or puppy and how we should look after them. There are several cute touches to the puppy surprise which make it even cuter including the sparkling collars on both the mummy dog and the puppies and the touches of glitter throughout. The soft bodies are great for snuggling which is great news as Evelyn hasn't stopped wanting to cuddle her dogs. If there were any negatives for me I would have like to have seen a little more detail in the pups, the faces seem really detailed but the bodies were lacking a little and seemed a bit plain. It would have been nice to have seen them a little more plump and dog like just like the mum. However that's more from an adult perspective and it certainly hasn't bothered Evelyn who is besotted with her new pup pals. When not in use the puppies can be stored back inside the Velcro pouch that they originally came from on the underside of mums tummy. I thought this was a great idea as it meant they didn't get lost and it was handy to have somewhere to store the tiny pups when Evelyn wanted to bring them all out of the house with us. We received a wave 5 pup however there is actually a new range of pups out now (wave 8!) with 4 new pups to collect (Eliza, Lexi, Chloe and Stacey). Or if you already have a puppy surprise did you know that you can buy refill packs for your existing puppy surprise? Each refill pack also has a surprise element too! Is puppy surprise something you think would interest your kids too?